Did you knows that russian pancakes could be filled with tons of ingredients? Stuffing could be from minced fish, cheese, caviar, cottage cheese or fried vegetables, for exmple. 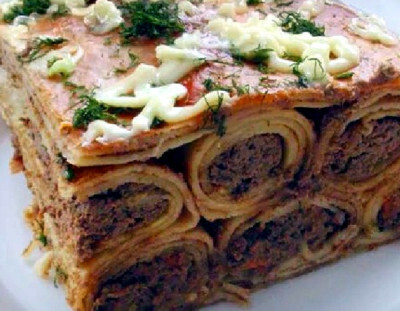 Try to cook delicious russian dish - Bliny or Pancakes with Livers - well tried and tested Russian recipe, taken straight from old books and manuscripts. beat up egg yolks with salt, sugar and melted butter. Then add warm milk, stirring all the time, and gradually, making sure there are no lumps, mix in flour. Now add beaten white of egg, and the pancake mixture is ready. Fry pancakes on both sides in boiling fat. boil lights and liver for 15-20 minutes, first scalding liver with bay leaves, peppercorns, carrot, parsley root, one onion, and salt. Drain and remove parsley root, peppercorns and bay leaves. Mince lights and liver and fry the other onion, finely chopped. Mix onion and mince, add finely chopped hard-boiled eggs and mix thoroughly. Lay the pancakes in a saucepan of suitable size, on each one spreading a layer of the prepared mince (after it has cooled). Bake in a slow oven for one hour.